10 night cruise sailing from Broome aboard the Coral Expeditions I. 11 night cruise sailing from Darwin, Australia aboard the Coral Expeditions I.
Deluxe Staterooms are located across the top decks of the ship, in close proximity to the Bridge and the Sun Deck. WIth brilliant natural light and fresh modern decor, Deluxe Staterooms are a spacious 17sqm (185 square feet) in size and feature picture windows for expansive ocean views along with a comfortable settee, desk, ample storage space and your choice of double or twin beds. Upper Deck Staterooms are located on Deck B, a dedicated accommodation deck offering a quiet environment, yet still in close proximity to the Bridge, Sun Deck and Dining Room. With modern decor and comfortable furnishings, Upper Deck Staterooms are a spacious 14sqm (151 square feet) in size and feature picture windows for expansive ocean views along with a desk, ample storage space and your choice of double or twin beds. Stateroom category rooms are located on Deck C, close to the Dining Room and our Explorer excursion boat boarding platform. Ideal for those wishing to avoid stairs, Stateroom category rooms feature modern decor and comfortable furnishings. At 14sqm (151 square feet) in size Staterooms offer plenty of space to relax and feature picture windows for expansive ocean views along with a desk, ample storage space and your choice of double or twin beds. 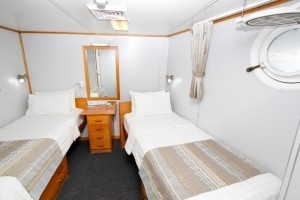 Perfectly suited to those guests on a budget, Cabin category rooms are located on the lower deck, downstairs from the Dining Room and our Explorer excursion boat boarding platform. Cabin category rooms feature modern decor and comfortable furnishings and are a compact 10sqm (108 square feet) in size. Cabins feature twin circle portholes, air-conditioning,a private en suite bathroom, ample storage space and twin beds.